In the mood for more traditional Southern cooking? 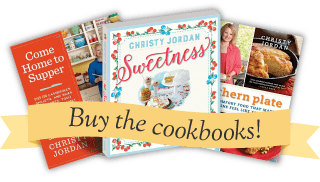 Click here to check out Crispy Breaded Pork Chops with MeMe’s Mashed Potatoes and Milk Gravy, or try some fried cabbage and Sweet and Sour Green Beans. For dessert, how about peanut butter or coconut pie? YUM! Now that we’ve done all that mental cooking, it’s time to sit down with a nice hot drink…. A few months back I met my friend Lisa in a local coffee shop for a little chat and when I got there she had ordered me their Spiced Vanilla Chai. I had never had this stuff before and one sip had me leaping over the moon, it was so good! I was really surprised that it wasn’t coffee because it has such body to it and depth of flavors. It was like a perfectly baked ginger cookie dipped into perfectly made coffee – I was in heaven. Lisa was quick to tell me that this Chai was exceptional and not to get it anywhere else expecting it to be this good. She told me not to even attempt to try it at Starbucks because theirs can’t come close. I took another sip as my eyes just about rolled back in my head it was so good! However, I don’t drink sugar for a multitude of reasons so when the lady behind the counter told me she couldn’t make it sugar free, I was pretty disappointed. Good thing I don’t give up too easily! I set about on a mission to recreate their recipe. Since they could only make it one particular way I assumed they were using a mix of some sort, and it had to be one they made themselves to boot. At first I started making tea and adding in little spices here and there, but then I tried out several recipes online and eventually found myself at my friend Kelly’s blog. Lo and behold, Kelly’s recipe turned out to be an exact flavor match. The great thing about this recipe is that I could easily make it sugar free (or significantly lower in sugar) and that is what I’m bringing you today. If you’d like Kelly’s original recipe please click here to visit that and be sure and tell her I sent ya! I want to thank her for generously giving me permission to share her recipe with you today. You’ll need: Powdered milk, Ideal Sweetener*, Instant unsweetened tea, Sugar Free French Vanilla Creamer, and non dairy coffee creamer. *You can use regular sugar or splenda in place of the Ideal Sweetener. I found Ideal at Krogers packaged under their own label, but with “Ideal” listed on the front. You’re also gonna need a lot of spices, but they’re what MAKE this tea so stinking good. Ginger, Allspice, Cloves, Nutmeg, White Pepper, Cinnamon, and Cardamom*. *Now this cardamom is going to cost a fortune. I spent around ten dollars for my bottle. However, you’ll have enough of it to make several batches. I have no idea how many times I’ve made this and I’m still using the same bottle. Now this is where you decide if you like stronger or weaker beverages. If you prefer stronger flavors, use heaping measurements with your spices. I use heaping teaspoons, rather than teaspoons. 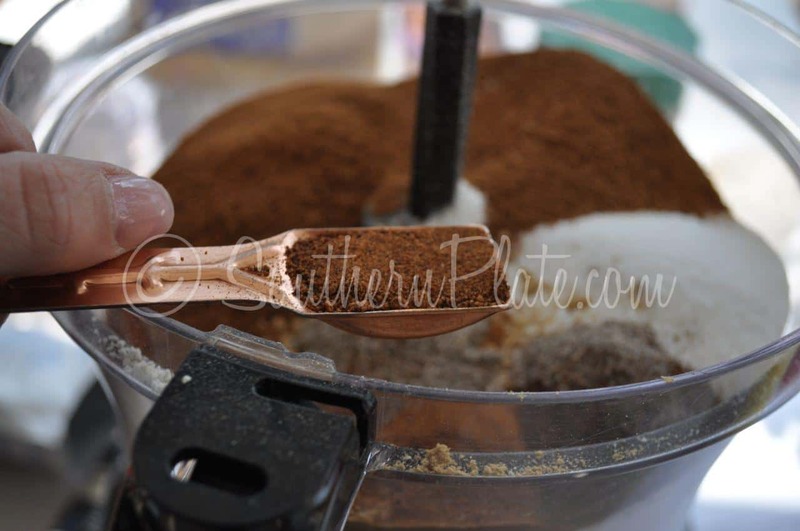 If you prefer your flavors a little milder, use the exact measurements listed in the recipe. 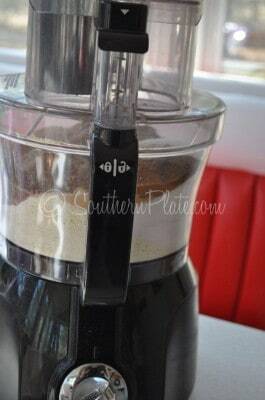 Once you have all ingredients in your food processor, put the lid on that puppy and get ready to make some mix! 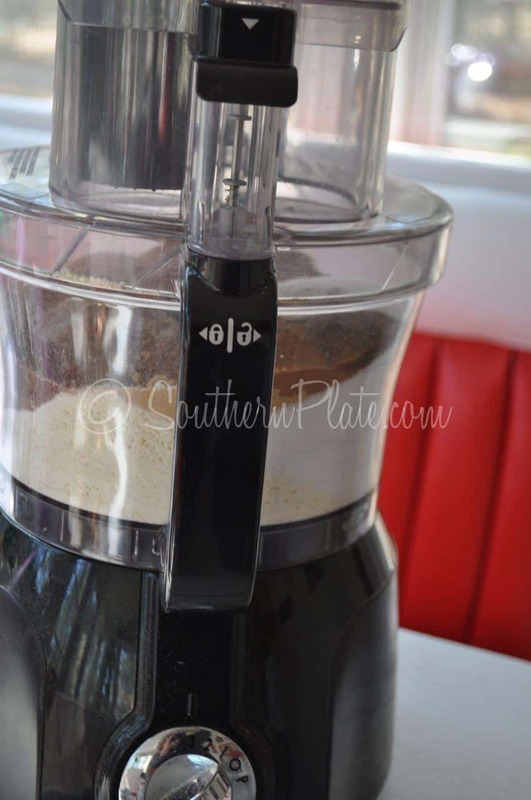 I’m using my workhorse Hamilton Beach Big Mouth Food Processor. They now have a deluxe version that is even less expensive than mine was (click here to see it). I’ve had this for a few years now and really put it through the ringer and it’s held up like a champ. If you don’t have a food processor, you can also use a blender but you may need to make it in smaller batches to have room. Just put your tea, spices, and powdered milk in first and mix those up really good, then you can stir the rest in by hand. This is what it will look like when done. Now, just store this in an airtight container to keep fresh. I like to put mine in little 8 ounce canning jars so I can have one or two to give away to friends. To make your chai, simply add two heaping tablespoons of mix to 8 ounces of hot water or milk and stir (I use hot water). 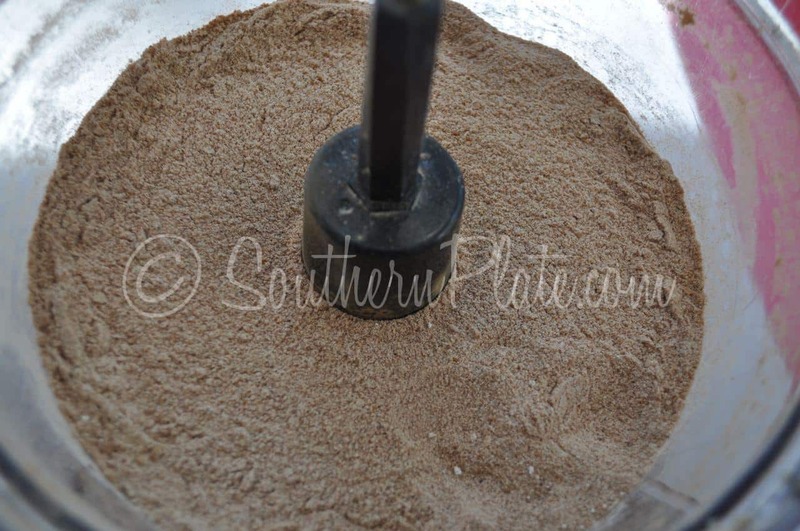 Place all ingredients into a food processor or large blender. Blend until it is a fine powder. Store in airtight container. 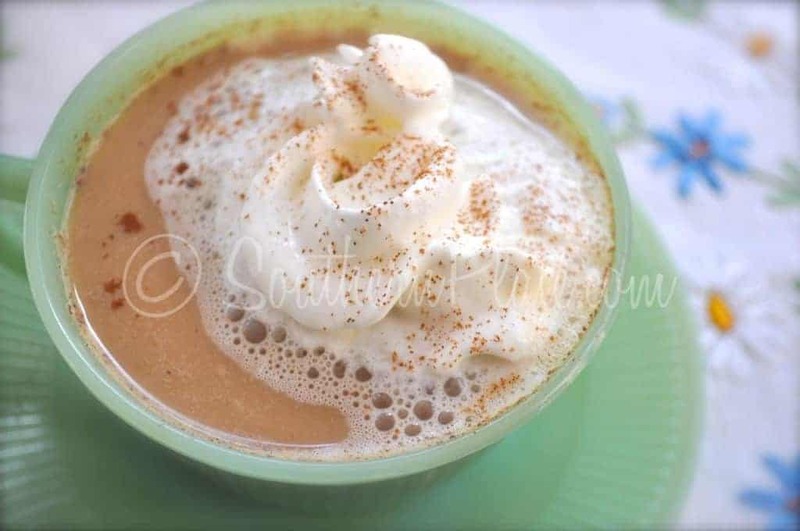 To make Vanilla Chai, add two to three tablespoons of mix to 8 ounces of hot water or milk (I use hot water). Makes about 6 cups of mix. For more information about substitutions and ingredients, please see the recipe post. and make sure you go that way, too! Saw on Facebook courtesy of Janie Upchurch. Thanks Janie! This sounds great!! Now, I know you are all about making things your own (which is one of the MANY things I just love about you! ), but I do have to say, I’m not a fan of Nutmeg… would it make a huge difference if I left it out? Hey Casey, I’m *really* *really* not a fan of nutmeg, which just makes us have even more in common! Usually, whenever a recipe calls for nutmeg I just double the cinnamon or replace it with cinnamon instead. 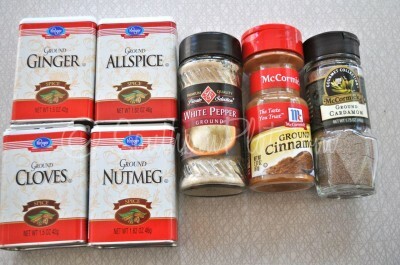 However, in this, I use it because all of the spices are kinda strong and work together so the nutmeg doesn’t stand out. However, leave it out, or double the cinnamon if you like! I totally feel ya on that usually ucky spice, lol! i don’t wanna sound dumb- but how do you say “Chai”? It sounds like eye with a ch in front. It is my favorite drink! So…how *do* you say it? Well…..I am also of the camp that says hot tea is GROSS and I will only drink it when I am sick. I’ve never tasted chai tea before, but I love giving drink mixes as gifts. This is one I’m definitely going to try! Do you think it would taste as good without the nutmeg? That’s one spice on my “don’t like” list. Oh Christy, I have used this recipe for about five years and I’ve even made up big batches and given them with homemade biscotti and pretty mugs for Christmas. I love this and the fact that it is sugar free makes it so well received. I am so glad you posted it on here. I also want to tell you I”ve been reading your blog for years and I bought your book and love trying all the recipes. My hubby loves them too. And for those who asked Chai is pronounced CHIY. Blessings to you and your family Christy. 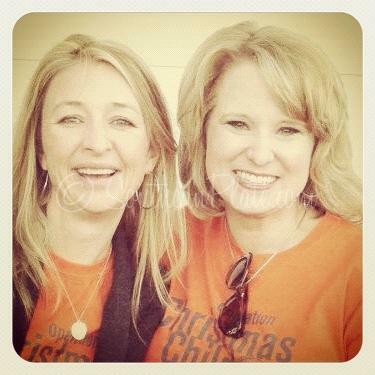 Thank you Christy! Love Chai Latte!!! Yum! Will be making this very soon. I too and cutting out as much sugar as possible. This is PERFECT! Just wondering……..how does it affect the final product (mix) if you don’t use a food processor or blender and just stir it together in a big bowl? By not using the processor or blender, you will probably get “floaters”, as in bits of nutmeg and less fine spices floating on top of your drink, which may bother some. For those of y’all that think nutmeg is “icky”…try using only 1/2 teaspoon of it, and choose cinnamon for the extra 1/2 teaspoon…this gives the blending of spices but NOT the power of nutmeg!! This stuff is soooo good. hugs and blessings to all y’all. i love vanilla chai too! I started out with that Oregon brand in the purple carton that you just dump in some milk. This recipe sounds wonderful and a ton more diabetic friendly. thanks for posting! I agree St. Arbucks is less than wonderful. I’m so glad you like chai. I’m a big fan of chai too but I generally tend to get the chai tea bags only because I don’t want to drink the powdered mixes too much. Of course the powdered stuff is wickedly good though, what with all the creamer and stuff. But the actual bags are still nice and I just make it up like a normal hot tea with milk and a tiny bit of sugar. I’m with you, Su! I’m considering making this mix, but it sounds like a lot of work and I might be tempted to overindulge if I had a lot of it and it is tasty. Funny story about getting the ice tea and milk in Vegas! Yes, we always have to specify hot tea if you don’t want to get cold! I guess since coffee is the American hot beverage of choice, no one really thinks of drinking tea hot! Of course, now people are making iced coffee, too, but you’d have to specify if you’d want that cold instead of hot! 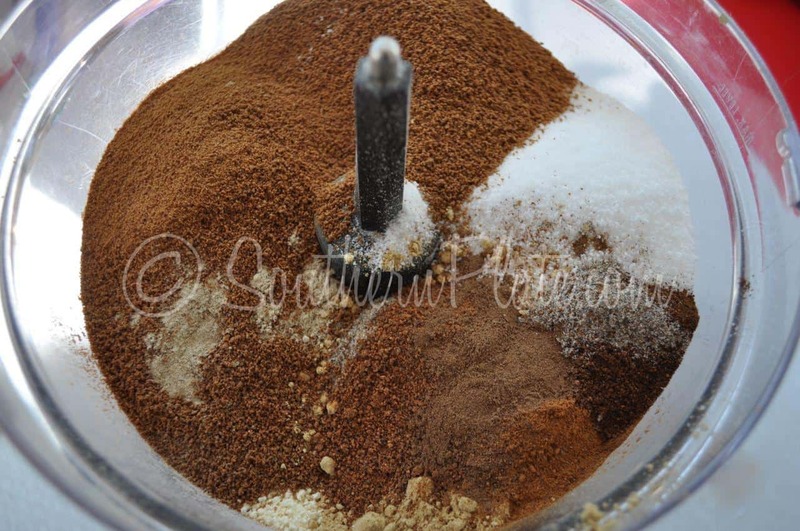 I, too, have been making this chai mix for several years…and I have made it sugarfree for my friends who need sugarfree. They love, and so do I. I’m glad you have posted this for others to enjoy!! Oh, you Nutmeg haters need to try zucchini sauteed in butter, then when it is tender add a tablespoon of sour cream and sprinkle with Nutmeg. Yummmm! The gracious Lord KNEW I needed a laugh today….thank you , Lord and thanks for sharing this gem! 😉 So glad I could help Dee!! Very similar to the recipe I’ve always used except yours has more tea. I think I like that, I’ll have to try it. Another idea for those who can’t have sugar is to leave the sweetener out entirely so that each person can use the sweetener of their choice. I actually found the mix I made using vanilla creamer to be sweet enough without adding anything. If Huntsville is anything like Memphis, you should be able to find an ethnic store (Indian or Mexican) that sells spices in bulk. You would not believe how low their prices are. My daughter picked up some cardamom for me for a fraction of Kroger or Walmart price. I have also bought bulk spice on Amazon for very reasonable amounts. I have 2 huge jars of dried cilantro right now that were very little over the price of a tiny bottle at local stores (if I could even find it). I hope you like it Michelle!!! Always wanted to try to come up with my own Chai Tea Mix…..thank you, thank you, thank you! I hope you enjoy it Dottie!!! You are so welcome! Sounds great Christy. I have always wanted to try this. I freeze my spices to keep them fresh longer. My freezer door looks like a spice rack. I hope you get to try it soon Deborah, let me know how you like it!! This sounds great. My son was on a kick where he had to have this everyday. I bought all the spices at an East Indian store. They were very resonably priced. I don’t know if you have anything in your neck of the woods. I remember the cardamom (whole) was only $4.00. 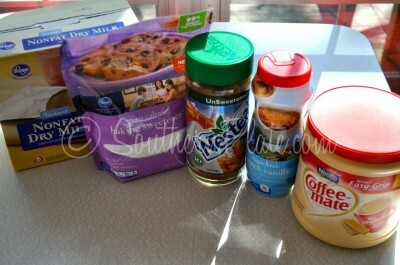 Looking at all the ingredients; the only ones I don”t have is the white pepper and the sugar free french vanilla powder. I’m going to surprise him with a some. I grew up with a Russian Chi tea which is an entirely different drink. So, I was excited to try chai tea the first time I was in an Espresso shop. I thought my taste buds and died and gone to heaven! Now to have a sugar free recipe really makes my day. I’m diabetic and couldn’t have it as much as I would have liked. That’s all over now!! Thank you so much, I can’t wait to get this mixed up, but I have to get some spices first. I don’t have white pepper. Never had Vanilla Chi Tea before. Can’t wait to try the recipe. I’m in Huntsville and was just wondering if you would reveal the local coffee shop you had it at. Thought I might try my first taste there. Love what you do! Thanks! I AM SO ANXIOUS TO TRY IT AND ESPECIALLY GOING TO MAKE SOME FOR MY FRIENDS TO TRY. THANK YOU FOR THIS GREAT IDEA. Christy, thanks for sharing this recipe. I love chai tea, but the mixes never seem right. I’m definitely going to try this. I’ve already tried the Ideal sweetener at your recommendation and I like it so much better than Splenda! My boyfriend is on a low carb diet and both his parents are diabetic so I always appreciate your recipe with low sugar or sugar substitutes. I have made this recipe 5 or 6 times since I found the recipe a couple of months ago. I was, and am, totally addicted! Now…my doctor tells me powdered creamer has been linked to heart disease!!! HELP…somebody please help…what can I do or use instead? I’ve got to make more of this…somehow! why not leave out the creamers and make the tea add half&half or whole milk in place. That is what I will do. If you want a true indulgence,try using half hot water and half milk combined before stirring in the chai mix – wow!